. It is still in the press and I will update the post once it is out. Our work on thermal metamaterials is now highlighted by Philip Ball in , News and views, Nature Materials. You can find the article here. The main thrust of the view is inverting thermal diffusion in a thermal gradient using thermal metamaterials. The pictures shown below is one that can illustrate what I am talking about. There is a gradient from left to right, but within our metamaterial shell, we observe the gradient to be from right to left. The metamaterial device is constructed out of isotropic materials arranged in a spiral fashion( derived by coordinate transformation) to form the anisotropic device. This is a experimental demonstration of thermal metamaterial. I am on physics today !!!! physics today. The link is here. Our article , titled “Heat flux manipulation with engineered thermal materials” that will be published in PRL shortly, has been featured in sciencenow. 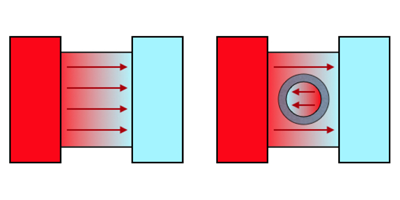 The titled in the news article is titled ” Heat Trickery Paves Way for Thermal Computers” which gives a brief description of thermal shielding, concentration and inversion. The link to the sciencenow article is here. The concept of heat has been known for a long time, and yet it is nontrivial to manipulate its flow. Here, we show that artificial materials can be engineered to guide the heat flow in unconventional ways. The conductivity of the artificial materials are engineered for diffusive energy transport of thermal conduction and experimentally shielding, concentrating, and inverting the applied heat flux. The artificially engineered materials are otherwise known as metamaterials. I will upload more details once the paper is published. The acceptance notice is here. My friend, Dr Gajju Pandey, enjoying his new ride- the 2009 Kawasaki Vulcan. Enjoy!!!! I will be adding new page, it will link to my professional site.